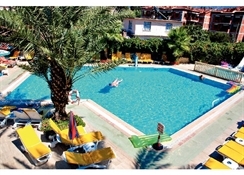 The Hibiscus Garden Hotel Apart is a family-friendly apartment hotel located on a quiet street in Marmaris, Turkey. The nearest beach, Marmaris Public Beach, is just 2.2km from the property. The hotel has two swimming pools with water slides on its premises. The hotel features a spacious restaurant that serves a wide range of delicacies, and alcoholic and non-alcoholic beverages. The property consists of two blocks housing the service apartments. Proximity of the hotel to the city and the beach makes it an ideal choice for vacationers looking for a sunny beach holiday, exploring the culture, heritage and lifestyle of Turkey. The Hibiscus Garden Hotel Apart is 96.8km from the Dalaman Airport. The nearest beach, Marmaris Public Beach, is 2.2km from the complex. The town-centre of Marmaris 2.6km away. Attractions and local landmarks such as the Marmaris Marina, Dancing Fountains, Marmaris Museum, Onmega Dolphin Therapy & Activity Centre, Marmaris Atlantis Waterpark, Marmaris Beach, Aqua Dream Park, Mustafa Kemal Ataturk, Ancient City Amos, Bar Street Marmaris, Ataturk Park, Marmaris 19 May Youth Square, Marmaris Mountains, Dolphin Park Marmaris, Turunc Sahil, Marmaris Balevi, Amos Beach, Kervansaray Turkish Night, Wednesday Market, Carian Trail and Marmaris Travel Centre, among others are located close to the hotel. The Hibiscus Garden Hotel Apart has tastefully-decorated apartments featuring modern, minimalist and contemporary architecture. These are categorised based on the space and number of occupants. The apartments come equipped with facilities and amenities such as air-conditioning, Wi-Fi, ceiling fans, kitchenette with stove, upholstery, bed linens, bath linens, essential toiletries, etc. The Hibiscus Garden Hotel Apart houses a spacious restaurant and bar that serve a wide range of delicacies from local Turkish and international cuisines along with a wide range of local wines, beers, signature cocktails, alcoholic and non-alcoholic beverages. Guests can also visit the local restaurants and bars in Marmaris and the beach, which are great to taste authentic Turkish cuisine. The Hibiscus Garden Hotel Apart houses two outdoor swimming pools with water slides, which serve as a great spot for recreational activities like pool games and refreshing swims. The pool is lined with loungers and sunbeds for guests to relax and sunbathe while enjoying a refreshing drink availed by the poolside bar. Guests can indulge in indoor games like billiards at the hotel. There are plenty of avenues for water-sports in the sunny town of Marmaris. The beach is only 2.2km from the hotel. The town has a lot to offer in terms sightseeing, allowing guests to explore the rich heritage and culture of Turkey up-close. Been to this hotel 7 times ,an every time fantastic can't fault it,the kids love it and the staff am absolutely brilliant ,never had a bad holiday here would highly recommend!!!! Great holiday good location and great staff. Rooms are basic but clean and staff are very friendly and helpful if any problems. Menus was good and catered for everybody. Been a few times and happy with the facilities.